This was supposed to be posted pre Feb. 14, 2007. 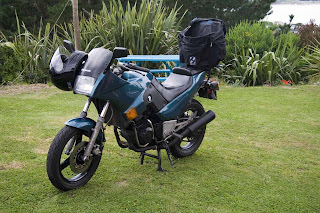 So, I finally bought a bike from friends of Glen and Lynnda for only $600 nz = $550 aussie, $500 cdn, $450 us, 1 British pound. It is probably worth $1000 as it is in really good condition, but hasn’t been running for 5 years. 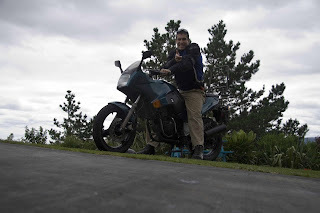 The bike is a 1987 Kawasaki GPZ 250, which you can see from the photos is a form of a street / sport bike. In NZ and in OZ learners are required to ride two years on bikes with engines no bigger than 250 cc before they can graduate to any size. Bikes of this size tend to be readily available in these countries and not so much in North America where we have no beginner bike size limits. 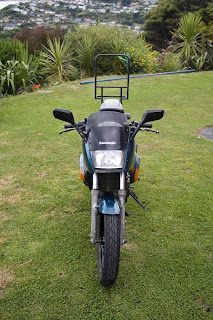 This bike was one of the top learners in 1987, and with an added travel rack and good tyres is a good buy. It has a top speed of 170 km/h and weighs only 360 lbs. Perfect for maneuvering tight corners. One problem that I noticed the day before was that I could scrap the side stand due to a soft suspension. This could cause a crash.